If you have a savings account, and I am pretty sure you do, you are probably not very happy with the return you get for your hard earned money. The problem isn’t really about the particular bank you are using. If you look around, I can almost guarantee that you will be very surprised if you find a bank, online bank or B&M bank, that pays you 1.50% APY (OK, I know there’s one, SmartyPig, 1.75% APY, but it isn’ t really a bank). I consider myself a rate chaser and the best I have among my more than half a dozen savings accounts is 1.30% APY from Sallie Mae Bank. The reason for such low interests for savings accounts that I can think of is the Fed benchmark rate. As you can see from the chart below, the Fed started to cut its benchmark rate since 2006 and the current rate has been kept at near zero for two years. And commercial banks have followed the Fed’s move to lower their rates since. With QE, QE2 already history and probably QE3 coming if the economy doesn’t rebound quickly, the rate is likely to have nowhere to go but south in the near term and will stay low for quite some time. 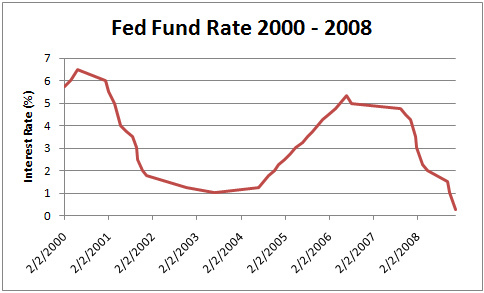 However, the Fed may not be the only reason for us to have such pathetic rates for our money in the savings account. THE F.D.I.C. RATE POLICE Last year, I wrote about the curious case of Ally Bank. Its troubled parent was the recipient of federal bailout funds, and competitors successfully persuaded the Federal Deposit Insurance Corporation to pressure Ally to lower the rates it was paying to consumers. In June 2009, shortly after the new Ally Bank was launched, I also wrote about their significant rate reduction, which was apparently the result of pressures from its peers and the FDIC. When you receive a lot of government money (in this case, not Ally Bank itself, but its parent GMAC Financial), you are not supposed to use that money grab market shares from your rivals by giving your customers the highest interest rate. Since then Ally Bank’s rate has kept falling. Now it pays even less than ING Direct does. Another piece of news I got out of the article is that PerkStreet Financial, which now has a checking account and debit card that give you 5% cash back on your holiday purchases plus 2% cash back on everything else, is planning to offer their own savings account, also with cash back, next year. It would be interesting to see what kind of rate they will have and whether they will, like many other banks we have seen so far, “pump and dump”. Anyone with real money ( not me) – say $5,000,000 – is getting a return on the whole wad that approaches a minimum wage job. Actually they are losing $200,000 a year. Kind if forcing people into the market searching for a bubble so they can lose the rest. Thanks!